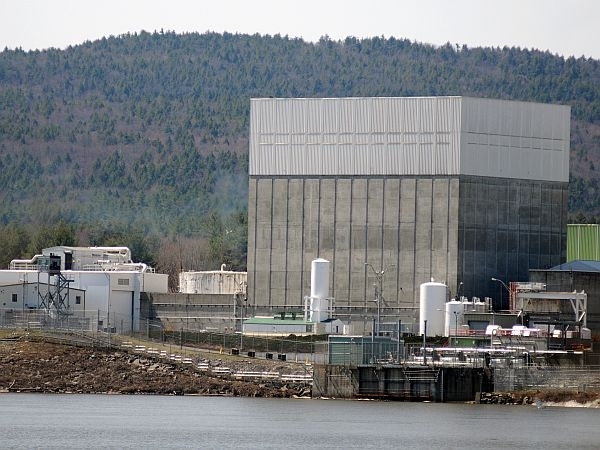 Time was supposed to run out for the Vermont Yankee nuclear power plant Wednesday. The plant’s license from the state of Vermont expires on March 21, the plant’s fortieth birthday. And opponents eagerly looked forward to the shutdown. That didn’t happen. A decision by a federal court has kept the plant running. The legal wrangling has only intensified the ongoing debate over Vermont Yankee’s value to the state. (Dillon) In the winter of 2010, Vermont Yankee contractors were busy drilling test wells on the grounds of the Vernon plant. They were looking for a plume of radioactive tritium flowing toward the Connecticut River. Tritium is an isotope of hydrogen, and it’s found in water that’s been exposed to the nuclear process. The material at Yankee came from underground pipes – pipes Yankee executives had said did not exist. (Questioner) "Does Vermont Yankee have any underground piping that carries radionuclides?" (Thayer) "The reason I hesitate is I don’t believe there is active piping in service today carrying radionuclides underground." (Dillon) That exchange took place in 2009 during hearings on Yankee’s request for a new state license. Entergy Vermont Yankee Vice President Jay Thayer testified under oath. Thayer was later disciplined by Entergy and no longer manages the Vernon plant. But his testimony and other misleading statements by Entergy poisoned what was already a tough relationship with the Vermont Legislature. Many lawmakers, including Franklin Republican Senator Randy Brock, said they no longer trusted the company. (Brock) "If its board of directors were thoroughly infiltrated by anti-nuclear activists I do not believe they could have done a better job destroying their own case. The dissembling, the prevarication, the lack of candor have been striking." (Dillon) Brock joined the majority in an overwhelming 26-4 vote to deny Yankee a new license. The statute that gave lawmakers authority over Yankee’s future later became the focus of a lawsuit filed by Entergy. The company charged lawmakers were focused on nuclear safety – an issue that under federal law is the sole province of the Nuclear Regulatory Commission. (Welch) "We can’t leave any stone unturned on the safety question. If we have a 40 year old reactor and they’re requesting that it be licensed for an additional 20 years and at a time that it may well be operating at a 20 percent higher capacity, then obviously you want to make absolutely certain about all safety questions being fully answered." (Dillon) Federal Judge Garvan Murtha looked at the legislative record and concluded that lawmakers were motivated by safety concerns. The state has appealed. Meanwhile, Yankee still needs a state license. Even Governor Peter Shumlin – an ardent opponent of the plant – concedes it will be operating while the state Public Service Board reviews the matter. And as the venue shifts back and forth from federal court to the PSB, big questions remain about the plant’s future. Arnie Gundersen, a nuclear engineer and Yankee critic, says the plant faces huge repair bills. One problem is the condenser, a house-sized piece of equipment that converts steam back to water. (Gundersen) "They still need to replace all these condenser tubes. But that takes time, it takes more than a month, and it’s over $150 million. Entergy hasn’t wanted to spend the money. Now they’re scheduled to spend the money in 2016. So they have to limp along for four years, either suffering leaks, or suffering power reductions. They’re stuck between leaks or power reduction." (Dillon) Other big ticket items are safety modifications the NRC has required since the catastrophe at Fukushima last year. The Yankee plant has the same design as the crippled Japanese reactors. (Gundersen) "So the question is, is Entergy willing to spend $300 million on a plant that’s 45 years old four years from now. I think not. I think a couple of years out, they’ll pull the plug rather than spend that kind of money." (Dillon) Yankee says it will evaluate the condenser issue and the new NRC requirements, but won’t comment on possible costs. Yankee’s supporters say Entergy and the Vernon plant have been good for the state. It employs about 600 people and pays millions of dollars in property taxes. Michael Hebert is a state representative from Vernon. (Hebert) "For 40 years, they’ve delivered clean energy, efficient, reliable. They’re one of the leaders in the industry as far as safety is concerned. They’ve had issues, but nothing life-threatening." (Dillon) Bob Stannard is a lobbyist for Citizens Action Network, which opposes the new 20-year license. He questions Yankee’s long-term economic benefit. (Stannard) "OK, there’s some jobs there. But if the trade-off is some serious ramifications to the state of Vermont, which I would argue already exists as a result of the leaking tritium, then it’s not worth it. We should look to create jobs elsewhere than banking on those jobs." (Dillon) The Public Service Board will look at these and other economic questions as it decides Yankee’s future. One issue that may be off the table, however, is the cost of Yankee’s electricity and the possible benefit to Vermont customers. As of today, Yankee’s contracts with Vermont utilities end, and its energy will be sold out of state.